With the night slowly succumbing to a muted and lacklustre dawn, the chance of a sunrise shoot was out of the question, but by eight o’clock it was brightening up a treat. I was off to waterfall country today, so as I jumped in the car I was in a chipper mood, and in short order, I was motoring up to the Vale of Neath to get me a torrent of goodness. Arriving in Pontneddfechan about an hour later, the weather had taken a turn for the worse, but I didn’t mind, the woodlands would provide me with shelter, and I was soon making brisk time to my first stop, Lady Falls. After a 20 minute walk alongside the swift flow of the Afon Pyrddin river, past trees fresh with spring green foliage, and the occasional gleaming clusters of bluebells. 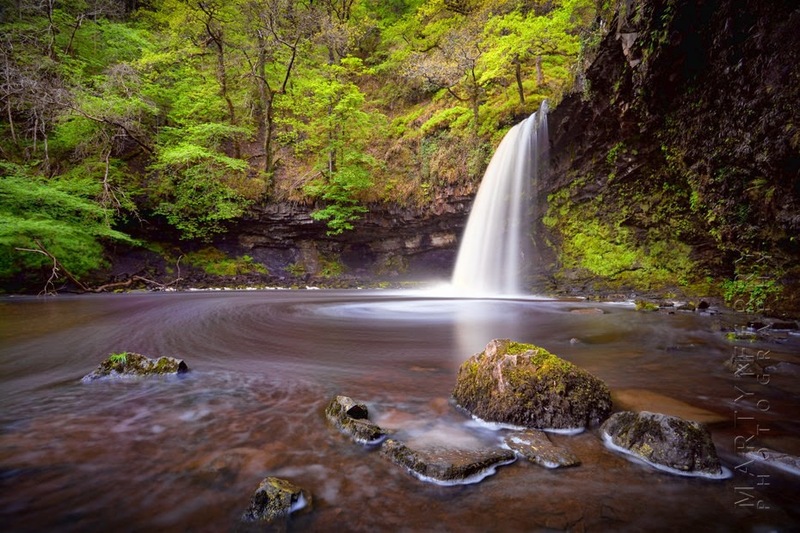 I arrived at Lady Falls, or Sgwd Gwladus, a picturesque 20 foot cascade from a lip of sandstone to a broad pool below. A view of Lady Falls in all her splendour. I wanted to get some long exposure shots while I was there, so I quickly broke out my 10 stop neutral density filter. With exposure times of 1 to 2 minutes it had the effect of negating the churn and ripples of the water as it surged downstream. Instead of a liquid landscape of troughs and peaks, it creates a glassy smooth texture to the water. Returning back down the path a short way and branching right, I arrived on the other side of the river to get some shots from a different perspective. This time I ventured into the water, to get a clear view of the falls from in front of a fallen tree. I kept to the shallows, as it was close to this spot last time I was here, that I sustained a thorough dunking, only managing to save my camera from a water-logged demise, by keeping it held above my head as I paid an impromptu visit to the marine life below. With that soggy and chilly afternoon in mind, I was more than careful as I picked my way over the slippery stone bed to get some shots, thankfully my prudent caution paid dividends, and I was back on solid land as dry as could be. It was then that I stepped into an innocuous looking puddle and sunk knee deep into viscous mud. As it oozed over the top of my wellington, sliding quickly and with surprising efficiency into the space behind, and as I struggled to free my trapped appendage from the glutinous mire, I realised I was never going to get out of here scott free, and I was a fool to think otherwise. I do like this clump of grass. I was getting hungry so I trudged back to the car and broke out the Welsh cakes stashed therein. I’d never had Welsh cakes before, and I’m not entirely sure what they are made of, but I’m guessing it includes cream crackers, flour and possibly dust. They actually didn’t taste that bad, but my mouth felt like it had spent 2 days in the Sahara after eating one. Gulping down water, I took the short drive to Upper Gushing Falls, or Sgwd Ddwli Uchaf, which was certainly living up to its name, thanks to the recent spell of rain. Taking my time, as I negotiated the slippery rocks along the bank, I was soon snapping away at this spectacular waterfall. Looking along the fast flowing Nedd Fechan river as it races towards me. These falls were throwing out a lot of water, and roaring splendidly. A view of the brightly coloured rocky bank as the water rushes over it. Before long it was soon time to go, I had a couple of things pick up in Bridgend, and I wanted to be back on the coast for sunset, as the rain had now cleared, and it was looking like it might be a beauty.